Growing up my mom seldom made cornbread. The cornbread that she did make came from a jiffy box, which while not bad, wasn't as great as the cornbread I had eaten at restaurants. As I grew up and learned to cook, I seldom made cornbread, maybe a couple of times a year. That all changed when I moved to the state of West Virginia. Everyone that I met had a mother that made great cornbread or corn pone. 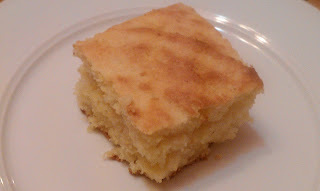 Over the years I slowly began to make more and more cornbread and experiment with various recipes. Today I can say that I make pretty decent cornbread and will try just about any cornbread recipe that I can find. A recent issue of Saveur magazine had a cornbread recipes, which looked simple and just a little sweet, which was perfect as a side for the pork stew I was cooking. This recipe has 8 ingredients and takes approximately 30 minutes of prep and bake time. As with most cornbread recipes, this is a very simple dish to prepare. My husband prefers salty cornbread and I prefer sweet, this recipe has 1/4 cup of sugar so it's definitely on the sweeter side. I followed the recipe as written with no modifications. While slightly sweeter than the normal cornbread my husband prefers, this cornbread was the perfect accompaniment to the Red Chile and Pork Stew I served (recipe to be posted tomorrow). Since the stew was slightly spicy, the sweet cornbread worked perfectly. If you prefer saltier southern style cornbread like my husband, make sure you serve this cornbread with something savory. Of course my two boys love any type of cornbread and ate half the recipe. This recipe is a simple, sweet cornbread, which would go well with a variety of dishes. For the recipe go to Saveur Cornbread. I like cornbread and from time to time I bake it. I have been having this for a long time. When I was very young I used to get it at every family gathering that an aunt-in-law had. It tasted real good also.